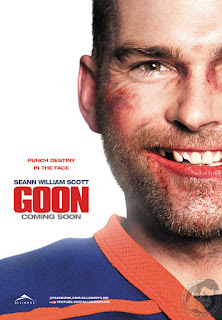 Reality by Rach : Sean William Scott Takes No Crap in 'Goon' Trailer! Sean William Scott Takes No Crap in 'Goon' Trailer! Ever wonder what it's like to be a Hockey enforcer on the ice? Well, if you're not from Canada, most likely your answer is 'no'. However, in the upcoming film Goon, partially written by Jay Baruchel of Knocked Up fame brings this career to light and makes it not only fun but interesting as well. Check out the trailer here!